In Parts I through III of this series, we examined the historical background leading up to the development of Nationwide Arena, the circumstances confronted by all of the involved parties today, and some options for addressing these issues in the future. In Part IV, we examine the landscape throughout the NHL, finding that the Columbus situation is truly unique. As a brief refresher for those unfamiliar with the territory, Columbus sought public funding for a downtown arena in 1997, in conjunction with its application for an expansion NHL franchise. The Arena was to be the centerpiece of a new urban mixed-use development area, known as The Arena District, which would replace the abandoned state penitentiary and revitalize the local economy. That effort was plagued by interference from other interests and lack of sufficient time, leading to a defeat at the polls. In a last minute effort to salvage the prospects for an NHL team, the late John McConnell stepped up to lead the ownership group, while Nationwide Insurance agreed to finance the Arena. Over the past few years, the Blue Jackets have incurred deficits of between $9 million and $12 million dollars, due largely to the fact that the Jackets bear financial obligations for Arena operation and related expenditures, while not having access to traditional revenue sources, such as parking, naming rights, all luxury boxes, etc. 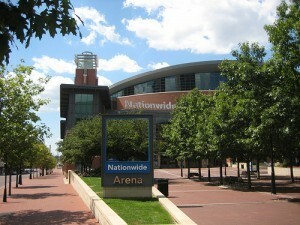 At the same time, the Arena District has more than fulfilled its promise, generating in excess of $31 million dollars of additional tax revenue each year, with that figure steadily increasing.The Blue Jackets, Nationwide and civic leaders are presently engaged in efforts to find a solution that will address all concerns. As the debate has freshened concerning the proper role of the public sectorwhen it comes to arena development and operation, questions have also arisen as to the viability of the Columbus ownership model. 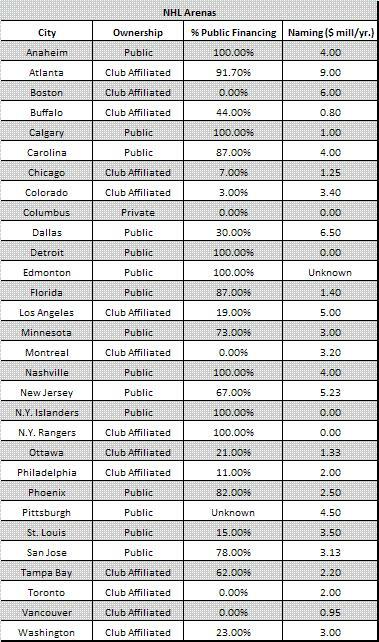 Delving intothe arrangements found in other NHL cities (See Table –click to enlarge) provides some significant answers. To provide further explanation, ownership is Public when the arena is owned by a governmental agency or entity. Club Affiliated refers to a situation where the ownership of the arena is vested in a private entity, in which the owner of the team is a participant. Private ownership refers to a situation where the arena is owned by a private entity not having an ownership interest in the team. The data was obtained from public sources, and individual numbers were included only when provided by multiple sources. No confirmable details concerning Rexall’s naming rights deal in Edmonton were available, nor could the amount of public participation for the new Consol Energy Center in Pittsburgh be determined, due to some unique aspects of the financing for that arena (mentioned below). What should immediately catch your attention is the fact that there is only one arena in the NHL in the Private category — Nationwide Arena in Columbus. We will examine the ramifications of that momentarily, but some other trends are worth discussing first. Of the remaining 29 arenas, 15 are owned by some public entity, while 14 are owned, directly or indirectly, by the individuals or entities who own the NHL franchise, either individually or in partnership with others. In looking at the club owned arenas, some common attributes can be discerned. These arrangements tend to fall into one or more of three categories: 1) cities where there are multiple major tenants (i.e. NBA and NHL franchises); 2) the major Canadian venues, where attendance is routinely 100%+ of capacity; or 3) mid-level markets where significant public money was provided. 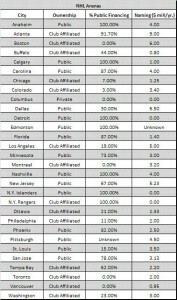 Of 14 arenas owned by club-affiliated entities, 9 have one or more additional major tenants (Atlanta, Boston, Chicago, Colorado, Los Angeles, New York, Philadelphia, Toronto and Washington). Atlanta (91.7%), Buffalo (44%), Tampa (62%) and Washington (23%) also benefited from having significant percentages of their cost covered by public funding. Of course, venues such as the Staples Center in Los Angeles and Madison Square Garden in New York are in a league of their own when it comes to event traffic. Club-affiliated ownership allows the club to derive all of the revenue from arena operations and take advantage of tax benefits. When an NBA or other major tenant exists, the number of guaranteed high-revenue dates per year increases dramatically, making this a beneficial economic model. This is particularly true in larger markets, such as Chicago, Los Angeles, New York, etc., where musicals, ice shows, and other events must go to be successful themselves. Buffalo and Tampa have struggled with this model, but have kept it going due to the significant level of public money originally invested, and, at least in Buffalo’s case, other holdings by the ownership group. Smaller markets, by necessity, tend toward the public ownership model. With these markets, the economic engine really works in reverse from the major metropolitan areas. Touring shows and concerts strive to get into the major markets, as the media attention, higher ticket prices and longer runs insure visibility and, ultimately, profitability. In contrast, it is the smaller market cities who are seeking to attract the concerts and touring shows. Cities achieve a measure of legitimacy by having attractive arena venues that can handle mixed use events. These types of entertainment offerings add to the community profile, enhance tourism and business investment. These, in turn increases the tax base, which permits the cycle of development to continue. Government involvement is critical in these markets, as the utilization of the arena, at least in early years, is seldom sufficient to generate enough profit to make private investment worthwhile. Thus, it is not surprising that virtually all of the arenas with little or no public financing behind them are owned by club-related entities. The two exceptions are Dallas and St. Louis. The City of Dallas owns the American Airlines center, but the Mavericks and Stars share generously in the revenues generated. In St. Louis, 20 corporations provided $30 million of seed money, and then provided back end guarantees for $98 million in loans to build the Scottrade Center. So, Nationwide Arena truly stands alone in being the lone NHL venue built exclusively with private funds, yet not owned by club-related interests. While the unique circumstances existent at the time make the evolution of this circumstance understandable, it equally clear why Columbus stands alone with this structure. When voters rejected the combined soccer stadium/hockey arena initiative in May 1997, the backers of the NHL franchise effort had less than six weeks to find a way to provide a venue and a team ownership structure that would satisfy the NHL and be locally feasible. There is no question of improper motivations on the part of either John McConnell or Dimon McPherson in stepping forward and providing Columbus with its first major professional team and a first class facility to host the team, and any number of community events. The devil, however, is in the details. Nationwide, while a generous corporate citizen of Central Ohio, cannot completely disregard its own bottom line when projects of this magnitude are involved. Keeping the naming rights to the building, together with many of the luxury box, parking and related revenues, helped make the project feasible, as did the breaks provided for property acquisitions for the surrounding Arena District. This was particularly important, given that Ohio State had rejected efforts to undertake a cooperative arena development, and proceeded with a competitive venue at the same time. The essential problem is that you have now injected two private enterprises — Nationwide and the Blue Jackets — into a situation where even a single private entity would be challenged to show a cash profit on Arena operations. For their part, the Jackets lease assumed financial responsibility for arena operations and their practice facility, together with rent and other expenses, without obtaining any of the benefits of arena ownership. Traditional revenue streams are not at their disposal, as they have been pre-empted by Nationwide. As the chart shows, having naming rights alone would significantly impact the financial picture in a positive way. The arena creates the draw for the private-sector investment and the private-sector investment generates the revenues to pay for the arena. The Columbus voters rejected that concept in 1997, but have been reaping the benefits of the outcome since then. Even a nominal portion of the increased tax revenue generated each year by the Arena and the surrounding District, combined with realignment of Arena ownership and lease obligations, would more than set the books straight, without increasing the tax burden. Other smaller markets have adopted creative means of keeping their arenas financially viable. In Carolina, a partnership between the local governments, North Carolina State University and the Hurricanes resulted in the development of the RBC Center, which hosts NC State functions, Hurricanes games, and a variety of public events. In Pittsburgh, the new Consol Energy Center will be funded in part by $7.5 million annual contributions by casino operators awarded franchises for gambling operations in Pittsburgh. While this is a diversion of revenue to which the local governments would otherwise be entitled, it is an “invisible” funding mechanism from the standpoint of the electorate. The “entertainment district” concept is used in Nashville, and is being explored in Edmonton, where revenues specific to usage are developed to retire public obligations for the Arena. The options are many and varied. In the final analysis, economic realities dictate some degree of public participation in Arena development and operation. Only 5 NHL arenas, including Nationwide, were build without public funds, and three of these are major Canadian markets — Montreal, Toronto and Vancouver. The lone US venue — Boston, benefits from a deep pocketed corporate owner and a partnership with the Boston Celtics, among others. Fortunately for all concerned, the days of the stand alone Arena are past. The additional tax revenues and downstream economic benefits from the Arena and the Arena District more than compensate for the relatively nominal financial support that ongoing arena operations will require. Additionally, given the far-reaching interests of Nationwide in the central Ohio area, there are numerous aveneus available for providing compensatory financial arrangements without increasing the direct tax burden upon the electorate. Recently, a community based group, Forward Together, has emerged in Columbus, devoted to educating the public at large about the benefits the Arena and the Arena District bring to the community each year, emphasizing that the issues are not about hockey, but about the arena and the community. Indeed, independent studies have shown that the Blue Jackets pure hockey operations run at close to a break even clip. In this instance, being unique is not a good thing. Now that the Arena District model has proven successful, and the community has reaped the benefit to the tune of hundreds of millions of dollars, it is time for the parties to establish a public/private partnership, with a common sense arena ownership and operation model. As in Carolina, a coalition of state, local and university resources can leverage the existing facilities to maximum benefit, and insure the ongoing vitality and expansion of the Arena District for years to come, potentially extending the concept to provide funding for the troubled Columbus Symphony and other cultural resources. The prospects are endless for a community on the verge of coming into its own. Such was the vision of McConnell and McPherson — it is incumbent upon the community leaders to not betray that vision.